Photodynamic Therapy is a non surgical treatment used most frequently to eliminate Actinic Keratosis, a pre cancerous condition of the skin. The procedure costs less than surgery and is covered by most insurance. During PDT a photo sensitizing medication is applied to the skin for 24 hours. The patient returns to the office the following day, and is placed in direct contact with a BLU-U Light Illuminator for a period of about 15 minutes. The combination of light and the photo sensitizing medication creates a negative reaction in the precancerous cancer cells. The cells eventually die off, leaving healthy skin below. Compared to other treatments, like liquid nitrogen, 5-FU, or Aldara, PDT is virtually painless and the side effects are minimal. Patients may experience a slight stinging, tingling, or warm sensation during their treatment, and will typically note a burning or stinging sensation for 24 hours after treatment. Slight redness and crusting will occur for up to 5 days following the treatment. PDT does not scar the skin and can be applied to the same area multiple times, should there be an incident of skin cancer recurrence. 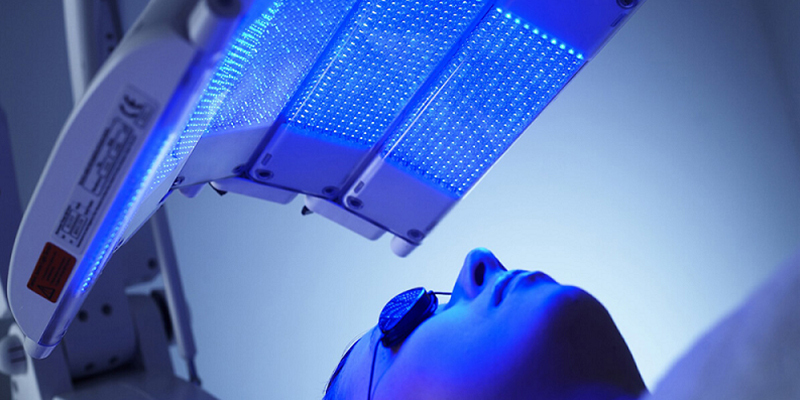 Photodynamic Therapy will create temporary sunburn-like conditions in the skin. Your physician will likely recommend that you avoid sunlight after treatment, and may recommend hypoallergenic products and other best practices for skin care during the weeks following treatment. In some instances, a physician may refer you to the practice's medical esthetician for treatments that aid in healing or repairing the skin after PDT treatment is complete. PDT is an excellent non surgical treatment option for pre cancerous skin cancers. Contact SCARS Center to schedule an evaluation today.